A study by the American Cancer Society, the Cooper Institute and the University of Texas suggests that being in good physical shape could safeguard individuals from the risks of sedentary behavior, including but not limited to obesity, metabolic syndrome, type-2 diabetes and cardiovascular disease. Study after study continues to tell us ‘sitting’s the new smoking’ and ‘inactivity is twice as deadly as obesity.’ But are enough of us doing something about it? We need to, for the sake of our long-term health, start treating workplace fitness as an absolute priority. Even working out after office hours cannot undo the damage of extreme inactivity in the workplace, highlighting that everyone; from couch potatoes to those who hit the gym five times a week, needs to do more throughout the day. Telecommuting saves workers money on subway or gas costs while conserving energy – but it can also mean less exercise. 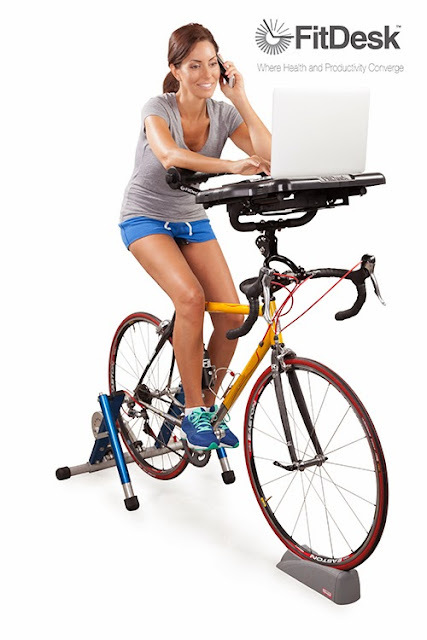 The folks at FitDesk have a solution – a brilliant bicycle/desk that combines work and exercise! 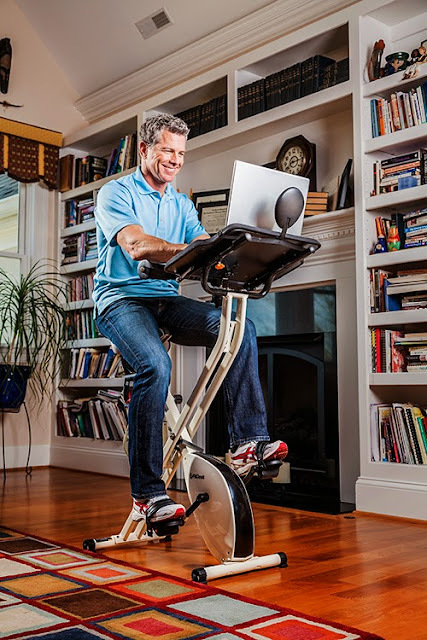 The stationary cycling system has a mount for your laptop, allowing you to burn calories while answering emails. The FitDesk is a unique invention that allows the user to exercise comfortably while working or surfing the web on their laptop. It frees your hands for typing on your laptop or gaming in a way that no other exercise bike can! It’s compact! It’s a sturdy & folds up quickly and easily so you can move it out of the way in your home, office, or classroom. When you buy exercise equipment, you shouldn’t have to build another room onto your house! It folds in seconds and the sliding desk-top holds your laptop, tablet, or book in place while you exercise. It also has universal straps for added security. The FitDesk Pedal Desk has a firm grip desktop, which keeps your laptop safe and secure while you pedal your way to fitness. The high-quality stationary bike offers various speeds and resistance strengths to ensure a great workout for users of all fitness levels. The Pedal Desk also offers a comfortable arm rest and support when used just as an exercise bike. The desk top can also be used to support the arms while you’re playing your favorite video game! The FitDesk was designed for the busy individual who may not have time for fitness and training, or new business ventures that require round-the-clock emailing, researching and writing on the computer. With FitDesk, users can train for a charity bike ride while cleaning out their inboxes. There is another product called ‘Cycle Pro’ which transforms your bicycle or indoor exercise bike (with 25mm or 32mm handlebars) in to a comfortable and therapeutic Desk that makes getting in daily exercise as easy as checking an email. FitDesk also makes an adapter model for indoor bike trainers, or for those who already have an exercise bike. The FitDesk PRO snaps onto the handles to ensure sturdy leverage for your laptop. Now you can kill two birds with one stone by exercising while you work, and enjoy more free time!